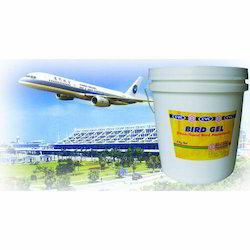 Supplier & Manufacturer of Bird Repellent Gel. Our product range also comprises of Two Wheelers Maintenance, Auto Care Products and Engineering Industry Lubricants. CVC BIRDGEL SPRAY is an Inert, Non-Toxic, Eco-friendly Bird Repellant gel to prevent birds from roofing and perching on any surface where birds create hazard. It is a non-corrosive gel, not affected by dirt, dust and any other contamination. CVC Birdgel Spray is an Aerosol Spray for touching up bird gel coating or to apply on inaccessible areas like corners and bends, inverted slopes & other architectural structures. CVC Bird Gel is also available in bulk in paste form which can be applied on levelled, sloped, angled or inclined surface without dripping, by brush or spatula. • Withstands rain, snow, winds. CVC Bird Repellant Gel is an to prevent bird from roofing and perching on any surface where bird-gel is applied. It is a which is not affected by dirt, dust and any other contamination. It all types of weathers such as etc. It is a product and as defined in osha 29 cfr 1910 1200 standard. Inert non-toxic Eco-friendly bird repellent gel non-corrosive gel withstands rain, snow, winds, sandstorms biodegradable non-hazardous beware. Bird drippings and nests may be dangerous to your health & hazardous to your environment it is available in spray able form which can be directly sprayed with pneumatic spray equipment for fast and easy applications. It is also available in aerosol spray can for touch-up to the bird-gel coating or to apply on inaccessible areas like corners and bends, inverted slopes & other architectural structure. Looking for Bird Repellent Gel ?